Lacy is an adorable eleven month old Am Staff mix with a huge white blaze on her chest and the tips of her paws, but I think I’ll let her speak for herself. 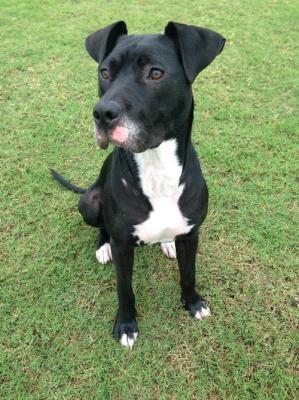 “I’m a 11 month old girl who’s looking for a fun family! I’m about 50 lbs and oh so sweet. You might notice that in some of my pictures, I am missing some fur. That’s because when my foster parents got me, I had a skin issue and I was underweight. But I’m all better now! 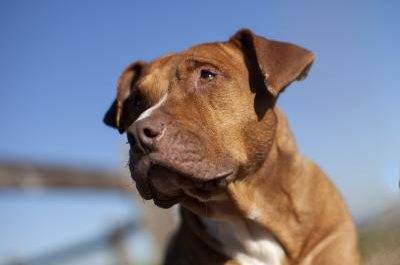 “I adore people and I get along well with other dogs. I live with my foster parents and their 2 dogs and we are great friends. I am a big goofball and sometimes I get really excited when I play, so I’ll need a doggie playmate that doesn’t mind a little rough-housing! I also love to eat and I am an excellent swimmer. 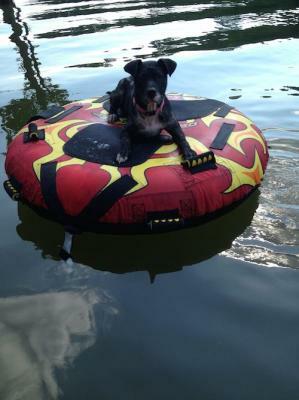 My foster parents take me to the lake and sometimes I just swim circles around the dock because I love it so much! “I am still young, so I need time to exercise and play each day. I know SIT, DOWN, WAIT, and PAW. My foster mom makes me wait for my food, so I have learned to have some patience. I am potty trained (as long as you take me out on a schedule) and crate-trained. I am working on walking better on a leash, although I will need practice in that area. I also need a home with no cats. And I get a little excited around small children, so I’d do best with older ones. But I am a rockstar on long car rides!